Hey Guys, Just like the original Sharkbanz, the Sharkbanz 2 product is NOT designed for use while spearfishing. However, many of our freedive and spearfishing customers also surf, so we are pleased to offer the Sharkbanz 2 Shark Repellent Bracelet to our customers who also surf. With improved design, materials, durability and deterrent power, Sharkbanz 2 delivers a better, stronger way to reduce the risk. Sharkbanz 2 are an easy way to add peace of mind to the everyday ocean swim, surf, or snorkel, but make no mistake: the science is real. Sharkbanz 2 enlisted the services of renowned shark experts, chemist Dr. Eric Stroud and marine biologist Dr. Patrick Rice. The two scientists founded Shark Defense almost 15 years ago, and are now the leading researchers in shark repellent technology. Sharkbanz 2 use special patented magnetic technology to deter sharks from attacking people. Most shark attacks occur in murky, shallow waters off the coast where there are a high number of swimmers and sharks sharing the same space. In this environment, sharks rely heavily on their electro-receptors instead of their eyes to “see” what’s around them. They possess the most sensitive electro-magnetic sense of all known animals, and use it to judge distance, shape, and even the heart rate of other animals near them. Most of the time, sharks get it right and leave people alone. Occasionally, they don't. Sometimes when relying on their electro-receptors, a curious shark may bite a person in order to figure out what he or she is. These unprovoked “hit and run” attacks are the most common type, and Sharkbanz 2 are an excellent defense against them. As the shark approaches a person wearing Sharkbanz 2, magnetic waves coming from the band disrupt its electro-receptors and it quickly turns away. The experience for the shark is, “like a person suddenly shining a very bright light in your eyes in a dark room, and it's not pleasant”, according to Dr. Stroud. Once a shark comes near the band, it frequently leaves the area and does not return. Dr. Rice says that the effect of Sharkbanz 2 is amplified if many people in a group of swimmers or surfers are wearing them. As more people choose to wear Sharkbanz 2, the more everyone’s risk is reduced. An approaching shark will be deterred sooner, keeping you, your friends, and sharks safe to enjoy another carefree day in the ocean. It is important for us to be honest about what Sharkbanz 2 technology can and can not do. Sharkbanz 2 will reduce risk of shark interactions but there is no 100% guarantee that interactions will not take place. This technology has been tested extensively on over ten of the most common predatory shark species such as Bull and Blacktip, which are responsible for the majority of "hit and run" attacks, and Sharkbanz 2 are an excellent defense against these types of attacks. Great Whites are unique in that they are the only shark that acts as an ambush predator, attacking from a long distance at high speed. There is no effective way to prevent this type of ambush attack. However, Great Whites rely heavily on their electromagnetic sense when swimming in open water, and Sharkbanz 2 could effectively deter an investigating Great White. Sharkbanz 2 are not designed to prevent sharks from eating visible bait. They have a hierarchy of senses and can override the electrical sense in the event that visible bait is present. Again, Sharkbanz 2 are meant to deter curious sharks from biting a person while in investigative mode, not prevent them from eating bloody fish bait. Sharkbanz 2 has not been testing in spearfishing applications and is not recommended for spearfishing. Sharkbanz 2 use no chemicals, batteries, or electricity to deter sharks, ensuring simplicity in use, storage, and durability. Just strap it on when you arrive at the beach, and let your fears fade away. Sharkbanz 2 goal was to make a product that posed no risk to the wearer, protecting people and sharks. Great care was taken so that no sharks were harmed in the testing of our product, and we follow all procedures and guidelines of the IACUC. At Mano, we like sharks, and if they could talk, we’d want them to say, “people are friends, not food!” Sound familiar? The safer we feel, the more likely we are to support these vital members of our ocean ecosystems. While there is no 100% guarantee against an encounter, Dr Rice says that by wearing Sharkbanz 2, the risk is significantly reduced. There’s a fine line between bravery and stupidity, so don’t cross it and provoke a shark by attempting to test this technology yourself. They are wild animals and don’t take kindly to people with bad manners. Respect the animals and they will respect you. Unlike other shark deterrent products, Sharkbanz 2 don’t repel people because of their looks. 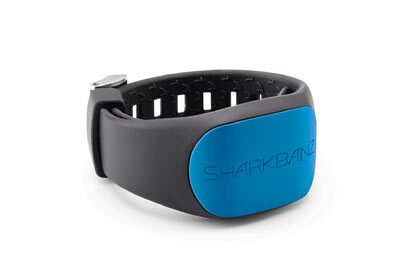 Sharkbanz 2 currently available in three colors in a compact, stylish design inspired by the most popular fitness bands. Sharkbanz 2 has a secure clasp system that will allow Sharkbanz 2 to fit the wrist or ankle of almost all men, women and children. Share it with the family or loan it to a friend, just make sure they give it back! You definitely don’t want to be the one without it. Sharkbanz 2 are not designed for children under 5, and young kids should always be supervised in the water and while using Sharkbanz. They contain powerful magnets, which can cause damage to electronic devices and computerized equipment. Always consult a doctor before use if you have any metal under your skin, such as pacemakers and hearing aids. Who are Sharkbanz 2 for? Sharkbanz 2 are for the casual beachgoer, swimmer, and surfer. This technology offers convenient protection for man, woman and child in a variety of activities. They are designed to prevent the most common hit and run attacks from the majority of shark species found in shallow coastal waters around the world. Who are Sharkbanz not for? There are a few more dangerous professions and situations in the ocean where protection beyond the level of Sharkbanz 2 is recommended. Commercial divers, spear fishermen, and anyone swimming, diving or surfing in waters known to be hot spots for Great White Sharks are advised not to rely solely on Sharkbanz 2 as protection. Sharkbanz 2 are designed to prevent investigative bites from curious sharks in shallow coastal waters, not to stop sharks from eating bait or stealing your catch. Great White Sharks are ambush predators and operate in a fundamentally different way from all other species. While Sharkbanz 2 might help your cause, we certainly wouldn’t go swimming near a seal rookery and expect not to be bitten. One Sharkbanz 2 will give you protection for your ankle or wrist, although two will provide greater defense. For swimming or surfing, we suggest wearing them on your ankle. When scuba diving or snorkeling, the wrist is preferred so that the band can be more easily directed at a curious or aggressive shark, but please be mindful of our magnetic technology and how it may interfere with a diving computer. 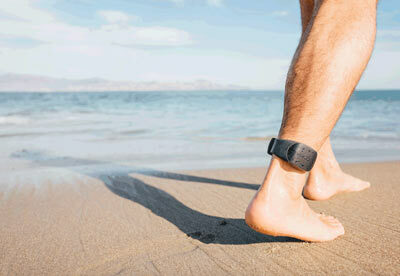 When surfing in sharky waters, our Founder wears one on each ankle. If you're absolutely terrified of sharks, you could fit quite a few on each limb! What’s the range of sharkbanz 2? The magnetic field is generated by your movement, but you don’t need to be overactive. The simple rhythmic current of the ocean moving you around is enough. Sharkbanz 2 does not need to be submerged in water to deter sharks so keep us in mind next time you take out that Ocean SUP or Kayak. 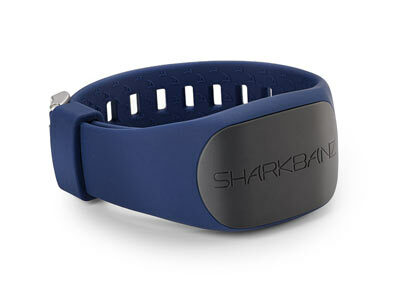 Will Sharkbanz 2 affect my medical devices such as heart monitor, metal plates, screw, etc? If you have metal or medical devices under the skin, always consult with your doctor before purchasing and using Sharkbanz 2. Will Sharkbanz 2 affect my dive computer and other scuba electronic systems? 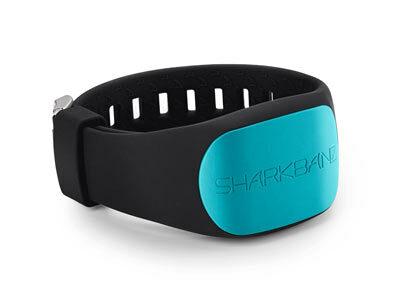 Sharkbanz 2 technology can harm electronic devices, including electronic scuba equipment, and should be kept at least 12 inches (30cm) away from these devices. If you are handling electronic equipment while diving, we suggest placing Sharkbanz 2 on your ankles to avoid direct contact with the electronics. Will Sharkbanz 2 attract sharks? No! Sharkbanz 2 emit a magnetic field that drops off quickly, so sharks cannot sense it from far away. Once they enter the magnetic field, they are quickly deterred. Has Sharkbanz 2 Technology been tested on all shark species? This technology has been tested on most common predatory sharks, including Bull, Blacktip, Oceanic Whitetip, small Tiger, Nurse, Lemon, Caribbean Reef, and Bonnethead. For more information on species tested, check our partners at SharkDefense . *Note from the scientists: official research tests showed that large magnets deterred Nurse sharks, but Sharkbanz 2 will not elicit much of a reaction. Nurse sharks are bottom feeders and use their electrical sense much less than most predatory species, instead relying on their keen senses of site, smell and barbels. They will bite if severely provoked, but are otherwise docile. Do not attempt to “test” Sharkbanz 2 when diving with nurse sharks, as you may provoke the animal. Do Sharkbanz 2 prevent Great White Shark attacks? Great Whites are unique in that they are the only shark that acts as an ambush predator, attacking from a long distance at high speed. There is no effective way to prevent this type of ambush attack. However, Great Whites rely heavily on their electromagnetic sense when swimming in open water, and Sharkbanz 2 could effectively deter an investigating Great White. By purchasing Sharkbanz 2, buyer acknowledges that Sharkbanz 2 are a deterrent to shark interactions and that there is NO GUARANTEE of no shark interactions. We liken Sharkbanz 2 to other safety devices, such as bike helmets and seat belts. They’re intended to reduce the risk of harm, but they cannot protect someone fully, all the time. Instead, they add protection when previously there was none. What is the depth rating of Sharkbanz 2? Sharkbanz 2 do not have any electrical or pressurized components, so they are safe from damage up to 100M. Do Sharkbanz 2 affect any other animals in the ocean? 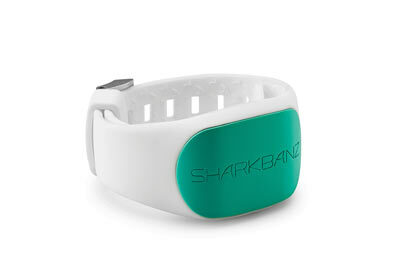 Sharkbanz 2 technology also deters stingrays, an added benefit to the product. The technology is not known to harm any other ocean creatures such as dolphins, sea turtles, or fish. Do Sharkbanz 2 have batteries? Sharkbanz 2 have no batteries and thus require no charging. They are powered by the magnetic field of the earth and are always "on". As long as the magnetic technology is not exposed to heat over 140°F (60°C) and the chassis is not physically damaged, the Sharkbanz 2 are operational. How long will my Sharkbanz 2 Last? As long as your Sharkbanz are not exposed to heat over 140°F (60°C) and the chassis is not physically damaged, then the magnetic technology will not lose its power. 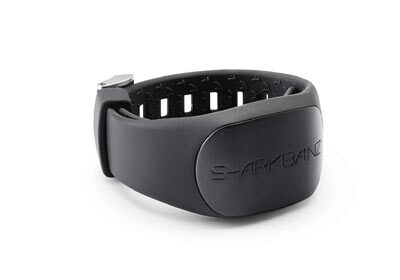 With regular use, we expect your Sharkbanz 2 band to last approximately 3 years. If there is a problem with your Sharkbanz 2, please let us know. After wearing my Sharkbanz 2, it appears as if something is leaking out of the banz…is my Sharkbanz defective? No! The magnets are very powerful and all ferritic (iron) particles will stick to the banz and sometimes look like a dark goo. Don’t worry; your Sharkbanz 2 is not leaking, nor is the effectiveness reduced. The best way to clean the particles off is to use a slightly damp or dry towel and smoothly wipe them away. Will Sharkbanz 2 fit me? What about my child? Sharkbanz 2 are designed to fit on either your wrist or ankle. Sizing the band to your ankle using the instructions below will allow you to wear in both places. In rare cases, Sharkbanz may not fit. The best way to find out for sure is to measure the circumference of the wrist or ankle with a tape measure. If it’s between 5.5 and 14 inches (14 and 35.5 cm) then you're are all set! Buckle the Sharkbanz 2 around your ankle securely but comfortably. Not too tight, not too loose. The Logo can face up or down, whichever feels more comfortable for each person, but the Logo side of the band must be on the outside of the ankle. Count 5 holes out from the buckle on the long end of the band*. Take a pair of household scissors (or sharper) and cut along the notched line after the 5th hole. Do this carefully to maintain the cleanest line possible. Now your Sharkbanz 2 should be appropriately sized to fit your ankle and wrist without too much excess band hanging off. Discard the excess band in the trash. *For surfers, swimmers and divers who consistently wear a wet suit, make sure to do this with your wetsuit on. Think of it like a watch; some people prefer to wear the watch under their wetsuit, some on top. This is a personal preference for fit, just make sure you take it into account before cutting off too much of the band. Your Sharkbanz 2 will arrive in special packaging with handy magnetic shielding to decrease the magnetic field put out by the product during transport and storage. We recommend storing your Sharkbanz 2 in its case when not in use to reduce the risk of damaging electronic devices nearby.